I used it when painting. The price was low and the material was thin and easy to use. As it is with powder, installation is smooth. As it is cheap, it is easy to throw it away. You will need to wash your hands with the powder because it is always removed. It is suitable for fine work with a thin feel close to the bare hand, but care should be taken as it can be broken quickly if you touch a sharp object. It is a difficult point that it is easy to tear, but it is good that it is easy to put it with powder. This product is a little bigger than other gloves, so it's easy to put on and take off very good. There is no improvement. Rather, I want you to continue selling as it is. Thin but hard to tear, always repeat. The price is very good. It is a cheap and easy to use product. We will also use it. Because it was cheaper with powder, I made it with powder, but I will make no powder after all. The powder interferes with the next work. Monotaro is handy even if it is cheap but it is handy and comes in handy. 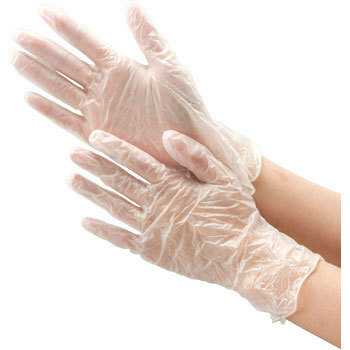 I bought it for cheap disposable gloves, but it was a very good item. Good quality and good. This is the second time. I will repeat again. It is inexpensive and easy to use disposable and easy to use. I always use it. It is cheap, easy to use, it can be disposable for cleaning work, it is handy. I thought that it was a monotaro brand of cheap and bad, but I was impressed with this good PVC gloves. The material is also soft and there is no sense of pressure. It is good because it is cheap, but it is a little thin and frequent exchange. Thicker thickness is a bit better with the same price. Cost is eventually used since it is used in two layers (lol) But it is a good product. Originally we used it for nursing care, but now it is useful for various work as it is very easy to use. I think strength is somewhat, but there is no problem if you use it considering the application. I am satisfied. It fits very handily so it is easy to handle. I am handy when cleaning and meat etc. It's easy to use without the smell peculiar to rubber gloves. Strength is doubtful. Ideal for motorcycle maintenance and painting work. Just to purchase it is hard to tell where the width of the palm points. I think that you can buy it with a slightly exact size if you add illustration to size notation. It may be such a quality, but it will shrink when working with kerosene, when inside is hot with sweat.